OPI The Man With The Golden Gun has a clear base and 18k gold flakes. 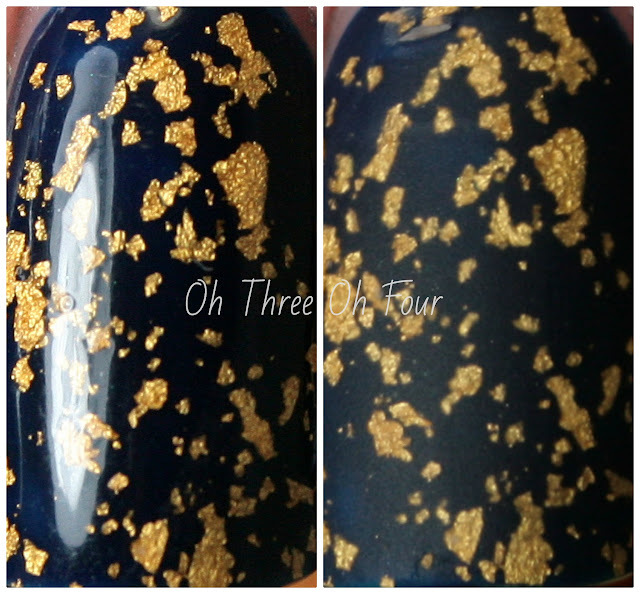 All nails are 2 coats of Barielle Berry Blue with 2 coats of The Man With The Golden Gun and a top coat of Seche Vite. Formula wise The Man With The Golden Gun was a little on thicker side and I did need to dab some pieces here and there, but I had no trouble getting out any of the gold flakes. This is the only gold top coat I have and while I personally can't compare it to other brands, The PolishAholic did a great comparison post here. The only wish I had when buying any brand's gold top was for there to be larger flakes and luckily my bottle of TMWTGG fulfilled my wish! OPI The Man With The Golden Gun was released as apart of OPI's Holiday 2012 Skyfall collection at the beginning of October 2012. You may still be able to find it at your local Ulta or other beauty retailers, though I haven't seen it in store for about a month. :( It can also be found online at various retailers like Amazon and eBay. Find OPI on Facebook here and Twitter here.